Do you ever find yourself standing in the middle of your kitchen, torn between something sweet and something salty? Sweet or salty? Salty or sweet? It’s the age-old dilemma, at least in my particular kitchen. But luckily for me, I now have my mitts on a recipe that let’s me have my cake and eat it too. Actually it’s a cookie. A sweet, salty, chocolate-dipped, utterly addictive so please don’t say I didn’t warn you Potato Chip Cookie. Yep, potato chips. I’ve gone down the potato-chip-and-chocolate road before, by literally dipping potato chips in chocolate (and oh yes – as insanely good as you think they are), but this puts the whole thing in cookie form. In this case, the potato chips are crushed into little potato chip crumbs and mixed in with the flour, so the cookie ends up tasting like a light, crunchy, sweet and salty shortbread kind of cookie. And then you dip it in chocolate. And then you wipe happy salty tears from your eyes, and you live happily ever after. Preheat oven to 350 and line two cookie sheets with parchment paper. Combine potato chips, flour, pecans and salt in a bowl. Beat butter and both sugars in a mixer until fluffy, about 3 minutes.Add egg and vanilla and beat until combined. Slowly add flour mixture until completely combined. Roll dough into 1-inch balls and place on cookie sheet about 3 inches apart. Flatten dough balls with your fingers until they are 1/4 inch thick. Bake for 5 minutes, rotate cookie sheet and bake for another 5 minutes, watching the cookies during the second 5 minutes to make sure they don’t get too brown. Cool for 5 minutes on the cookie sheet, then cool completely on a rack. Melt the chocolate slowly in a double boiler, stirring until smooth. 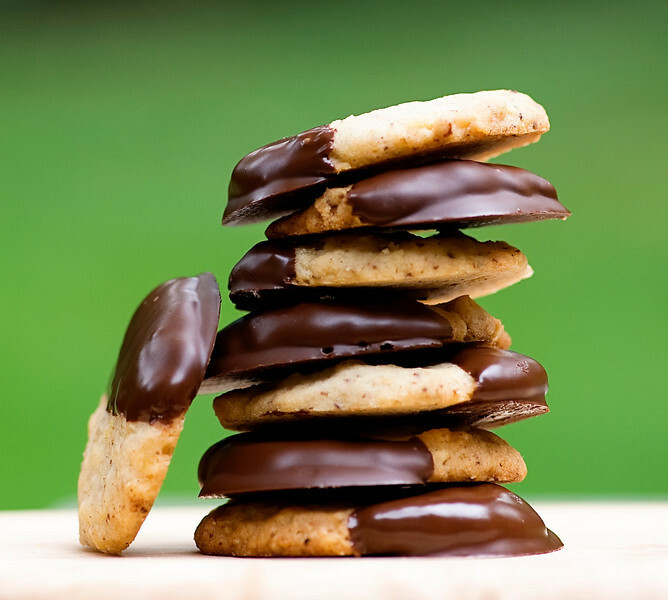 Dip each cookie almost halfway in chocolate, place on a cookie sheet covered with waxed paper and refrigerate until chocolate has hardened. Yuuuuummmmmm. These look heavenly! Love the salty/sweet action going on! I’m a total goner when it comes to sweet and salty A N Y T H I N G! Sweet and salty! So good! 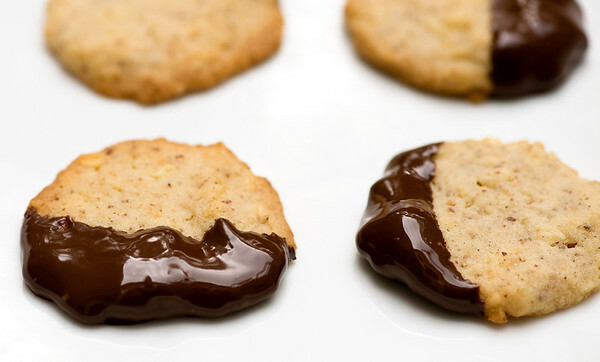 Yep – the chocolate-and-potato-chip version of heaven! These look delicious. My hubby & I make dinner together and rent a movie on Fridays. Tomorrow’s Friday… guess what we’ll be making??? How fun – the Southern husband and I have Friday rent-a-movie night too! Happy Friday and happy cookies! Looks absolutely delicious! I would so love to try some. I am sure they taste great! Oh, they do! Give them a try this weekend! I’m quite a sucker for all things sweet/salty. These are going to be my new addiction. I’m not much for cookies, or sweet things in general, but these, yes, these I may have to try. And look! That one there on the right? He is smiling a little chocolate smile. Who can blame him? OK, so I made this recipe from Cooks Country. Hubs loved them, I was “meh”. HOWEVER, had I thought of dipping them in chocolate, I would have been wowed by them. Hubs is asking for an encore batch, and I know how I’ll kick it up. Beautiful photos– especially the stacked close up. Double Wow! A dunk in chocolate is good for pretty much anything. :) and thanks for your sweet words about my pictures. It was about a million degrees outside when I shot that one, and I was really worried everything was going to start melting right in front of my eyes! Just wanted you to know they made these cookies on ABC’s show The Chew today. Why YES! I would love some of these sweet and salty cookies! Featuring you tomorrow at Create & Inspire. I’ve had chocolate dipped potato chips and wasn’t impressed. The potato chip just got lost in the chocolate. Can’t wait to give this a try, I love both potato chips and chocolate and you’ve found the perfect way to bring them together. Yumm! I’m definitely gonna make these! And I’m definitely not gonna share them! Can you tell me what brand of reduced fat potato chips you used? I don’t think I’ve ever in my life bought reduced fat potato chips! Of course you can tell that by looking at the size of my big bahonkass! LOL! I used reduced fat Ruffles (mainly because that was the only reduced fat chip in my supermarket) and they worked out great! I am new at baking cookies and have a dumb question, is that regular butter or unsalted butter…. Not a dumb question at all! Most recipes call for unsalted butter – I tend to use whatever I have in the fridge, but if you have unsalted that’s what I would use for this. Happy baking! Hi Chris! Regular chips make the cookies a little bit greasy – but the reduced fat chips work just fine!